Consider your Xbox 360 assimilated. 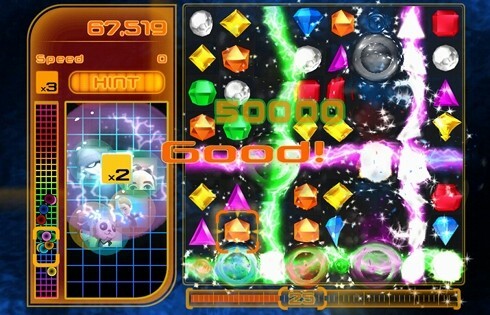 PopCap announced today that the company has launched Bejeweled Blitz LIVE on Xbox Live Arcade. The game costs 800 Microsoft Points, or $10 USD, and is essentially Bejeweled Blitz without the Facebook connectivity. However, the game does make liberal use of Xbox Live, allowing 16 players at once to compete in 60-second matches. You can also battle your friends one-on-one on the same console or over Xbox Live. The question is: Will your Xbox Live friends be as impressed by your Bejeweled score as your Facebook friends? Check out our preview of Bejeweled Blitz LIVE before rushing to the Xbox Game Marketplace and decide for yourself. Have you tried Bejeweled Blitz on Xbox 360 yet? What PopCap game would you like to see on consoles next? Speak up in the comments. Add Comment.